1) Hamlet=The Godfather, with the young "prince" choosing to become corrupt in order to avenge his father's death. 2) Macbeth=Godfather II, as the now-middle-aged hero uses "justifiable murder" to further his ambition, and proves that absolute power absolutely corrupts. 3) King Lear=Godfather III, when the elderly king, drunk on his own egotism, ends up setting in motion the events that kill his beloved daughter. In The Godfather I, Michael is the youngest son of the Godfather. 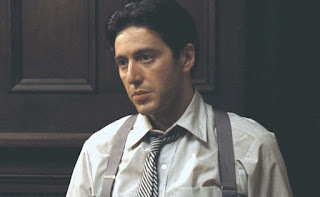 His parents and his elder brothers work hard to shelter him from the "family business" of Mob crime. He starts out as something of an innocent prince, idealistic and heroic. He enlists in the Army in WWII and becomes a war hero. Our first sight of him is in his uniform at his sister's wedding. While around him are the decadence and dealmaking and violence of his family's business, Michael is shown as apart, pristine, with his lily-white girlfriend and his open disapproval of the influence-beggars who come to kiss his father's ring and beg for favors. In the last scene, that same girlfriend, now his chastened and cynical wife, watches as violent men come to pay their respects to the new Godfather-- Michael, now so corrupt he has killed his sister's husband and lied about it to her face. The first thing we should do when we're starting to plot is to identify the starting and ending point of the journey. And the story events take the character from that start to that end. The next big step is to think about what starts the change. After all, we tend to resist change. If being innocent all this time has been good for us, let us go to college and escape the family, gives us military medals and a blonde girlfriend, even earns us the approval of our doting parents and brothers-- why would we change? Why would we even consider moving from that blessed innocence to something as morally and physically dangerous as corruption? What would it take to force us off our intended path onto this new journey? In Michael's case, it takes an assassination attempt on his father, the Mafia don. Watch that scene (where Michael doesn't appear), and then the next, when Michael stands off the murderers coming to finish the job on his father. That provides the motivation for Michael to start to change. He learns that he still loves his father passionately enough to do anything to protect him-- and that he has no fear in facing possible death. But that's just the first step on the journey. Michael hasn't done anything wrong. He hasn't committed any action that is morally wrong yet. He has the motivation for the change, and the will to change, but for greatest effectiveness, the story should show the choice to change. That happens here, when Michael starts plotting the retaliation against those who injured his father, to the amusement and eventual respect of his brothers. And a decision by itself isn't a step on the journey. It takes an actual action, played out in a pivotal scene, as here when Michael enacts his planned revenge and shoots his father's enemies. The most important aspect of using the character journey to plot is to PUT IT IN THE STORY. That is, have the steps of the journey take place in the story events and scenes. Show where the character starts in some clear way (Michael coming late to his family wedding, sitting apart with his blonde girlfriend, telling her disapprovingly about his father's violence). Show the motivation for change in some inciting event. Show the choice to start changing, and the essential first act, the irrevocable one that can't be undone. Then the character journey will be an essential part of the plot, set forth in the story events-- creating not just reaction, but also character action, . Anyone have a character on a negative journey? Let's discuss! I have a sense that for a basically good person to start turning bad, the motivating event should be pretty dramatic and intense. What do you think?